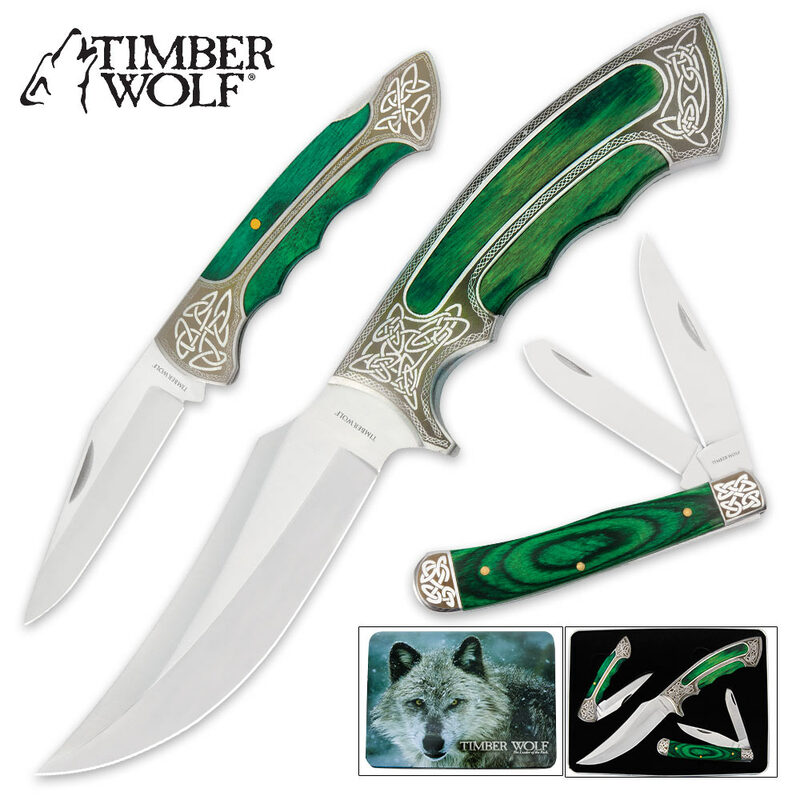 Timber Wolf Elite Celtic Knife Set | BUDK.com - Knives & Swords At The Lowest Prices! Fixed Blade: 9 ¾" overall, 5" blade. Trapper/Lockback: 4 ¼ " closed. 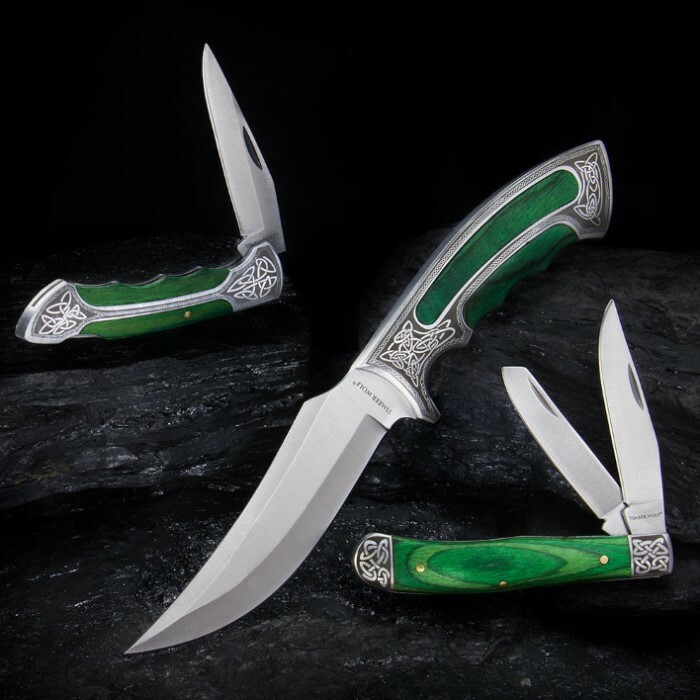 Give a timeless gift or treat yourself to a classic collectible knife set with this exquisite Elite Celtic Knife Set with a commemorative tin, only from Timber Wolf. Each set includes a full-tang Hunter, a Lockback and a Trapper, all beautifully displayed and housed in a custom Timber Wolf gift tin. Order today, because they won't last long at this unbelievable price point! Honestly for the price I'm impressed with what I got. I would love if the fixed blade could come with some kind of sheath or I could purchase one specifically for it, but it gives me a good craft project to work on. The other two knives are great! Need sharpened a bit but still, I'm very impressed! These are great to look at, wish the green was darker but it's fine. The knives are great and work well. Once you take them out of box you can't get them back in easily. It takes some work to get them back in. They are slightly rough around the edges, needs some filing and it's perfect. This is an amazing set! The hunting knife fits my hand as though it was custom-built for it, and I carry the pocket knife with me for just general use - opening mail, cutting cord, etc. The lockback... well, it's true, the lock is very stiff and hard to open, but the blade is sharp. I've said nothing about the look of this set, which was one of the reasons I bought it, but the handle scales and the Celtic knotwork look good together. I might be buying another of these sets for a friend... 'nuff said ! This is one of the best knife sets i have had in along time. Besides the fact that the pocket knives are had to open and the fixed knife doesn't have a sheath you will get used to both. They are great knives! Nice set. Nicely done. I took them out of the tin and they felt a little gritty. It would be nice if there was a sheath for the fixed blade knife. Good value for the price.